When disaster strikes it may not be safe to remain in your home or work location and since you cannot predict what the wheather will be like in an emergency, make sure you have emergency supplies in place to keep you warm and dryno matter what the situation is. At home? At Work, On the Road? Are you covered? This Plastic Blue Tarp is 20' x 30'. The tarp is 5 millimeters thick, and has grommets every 36 Inches. It is also waterproof, mildew resistant and super UV resistant. This Plastic Blue Tarp is 16' x 20'. The tarp is 5 millimeters thick, and has grommets every 36 Inches. It is also waterproof, mildew resistant and super UV resistant. This Plastic Blue Tarp is 10' x 12'. The tarp is 5 millimeters thick, and has grommets every 36 Inches. It is also waterproof, mildew resistant and super UV resistant. This Tube Tent accommodates up to two people. 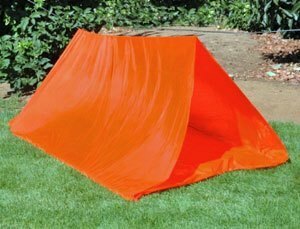 This Tube Tent comes with a highly visible tent tarp, rope, and setup instructions. The tent tarp measures 8.5' x 6'. This Plastic Blue Tarp is 8' x 10'. The tarp is 5 millimeters thick, and has grommets every 36 Inches. It is also waterproof, mildew resistant and super UV resistant. This Plastic Blue Tarp is 5' x 7'. The tarp is 5 millimeters thick, and has grommets every 36 Inches. It is also waterproof, mildew resistant and super UV resistant. This Emergency Survival Blanket measures 84" x 52" and is designed to retain 90% of your body heat. It can be used as ground cover or as a shield from the sun, rain, or snow.